Its quite natural to want to capture your shark encounters on film and I would much rather see divers carrying cameras than spear guns, but occasionally the camera toting divers are even more destructive. If you want to share your experiences by recording them, then make sure you're not doing so at the expense of the environment. Getting the shot should not come at all costs. I spend a lot of time underwater with a camera and I have shaken my head at many blundering divers only to look down and notice my fins crushing something precious. 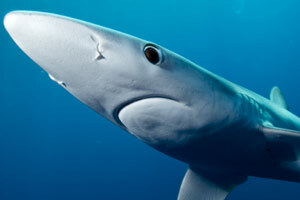 It happens, and when sharks are the subject it is even harder to concentrate on protecting the reef, especially when currents and surge are compounding the difficulty. Ask yourself this as you compose each frame: Am I prepared to kill or irreparably damage the reef to get this shot? How much destruction is my personal satisfaction worth? Maybe if you vocalize the question to yourself it will improve your buoyancy a little. If a Megamouth shark appeared on the far side of a cave filled with delicate fan corals, I think the mental struggle between breaking my way through to photograph the shark and watching it from a distance to protect the fragile ecosystem might bring on an aneurism. I hope I'm never faced with that dilemma. 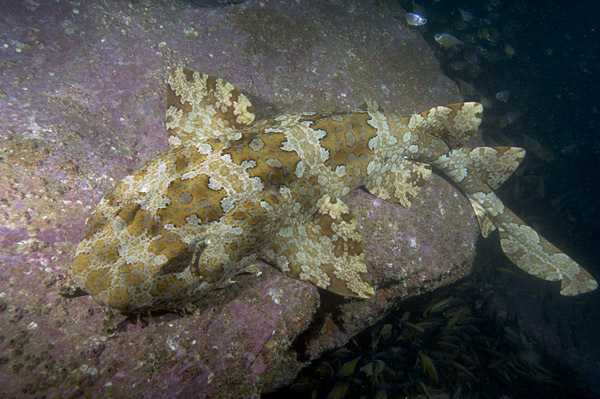 A motionless Tasseled wobbegong ambush hunting in a cave. 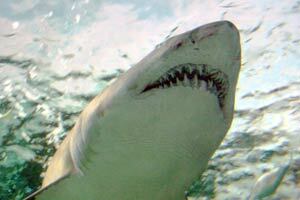 What about the mental and physical effects on the sharks themselves? You need to ask yourself what the sharks are doing and why? And, what will the effect be on that behavior if I swim over and start blinding them with my strobes? Apparently dolphins do things for fun. Cool. To my knowledge sharks don't. That means that whenever you approach a shark you are disturbing some activity that it needs to do, be it mating or merely sleeping. Its going too far to say that because of this you should never photograph a shark (then I'd have to get a real job), but you can minimize the impact that your intrusion has on the animal. I was pretty close to this wobbegong but I didn't position my strobes right in front of its face and I kept enough distance to avoid spooking it into leaving its resting place. Wobbies are known for their bad tempers so if I had pushed my luck I could easily have been bitten. Pushing and prodding sharks into a better position or cornering them to get the shot is plain and simple harassment and if the sharks decide that you've crossed the line you only have yourself to blame. Try to have some respect. Painting sharks in different lights. 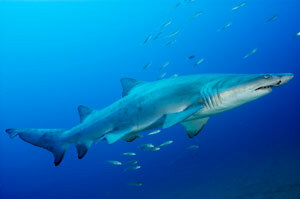 Maybe not quite, but now we have a grumpy looking Blue shark and a not so intimidating Sandtiger. There's no doubt that ferocious looking sharks make for exciting photographs and I talk about how to produce 'in your face' images on the shark photography composition page, but its worth giving some thought to the impact that your work will have on the fate of sharks if all that people are allowed to see are pictures of blood thirsty monsters. Get your Jaws look-alike shot if that's what you're after but step back and see if there is a way that you can beautify your subject as well. Then you can present both angles to your audience. To chum or not to chum, that is the question. 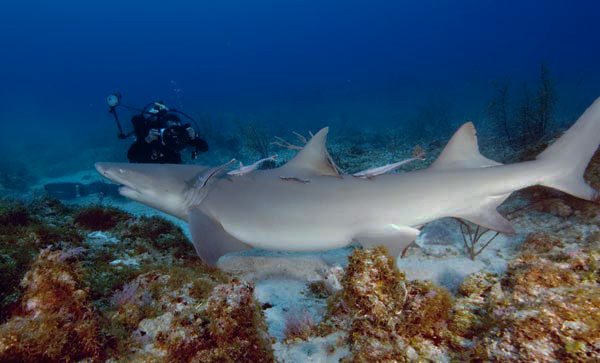 Whether it is nobler to not see and photograph a shark rather than risk habituating it to the presence of humans who may next time show up with big hooks. Hmm.... That one's gonna have to wait for its own page. 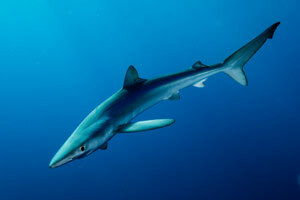 Andy Murch works as a Freelance Photojournalist specializing in sharks and rays.